Veuve Fourny has been an active family domaine since 1856. The estate is located in the prestigious Côte des Blancs, in the premier cru village of Vertus, an appellation that gives them the rare opportunity to grow Pinot Noir as well as Chardonnay. Veuve Fourny produces classic grower Champagne, raising pedigreed fruit, adhering to high standards, and hand-crafting wines that showcase the chalky terroir of Vertus. All of the Fournys’ vineyards are farmed according to the same meticulous practices and principles, and each parcel is vinified individually. The house style at Veuve Fourny is best characterized as classic Côte des Blancs: a fine bead, rich, deep aromatics, and a complex minerality emphasizing freshness and purity. The Fournys believe in minimal dosage for all of their Champagnes, preferring to let the individual terroirs express themselves more clearly. This technique, in addition to their dedication to partial malolactic fermentations in their overall blends, impeccable vineyard management, and their decision to age most base wine partially in barrel, all contribute to their unique style. 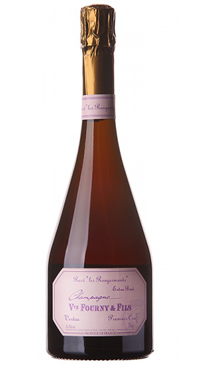 This rose Champagne is made from Pinot Noir grapes grown in the premier cru appellation of Vertus on fine red clay over gravel. The wine is made by the saignee method, fermented in vats and unfiltered. The first press juice rests for 7 months on the lees without any sulfites and then is blended and bottled for second fermention in bottle where the wine rests again for 2 years. This wine is not labelled as a vintage Champagne, though it is made as such. This is a very dry Champagne and is classified as Extra-Brut; just 3 grams per liter of grape sugar syrup.